As with all of our activities, we sort of fell into showing. 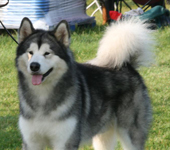 All too often, people buy one Malamute as a pet and we weren't any different! Kath and Walt suggested putting Kai into a show when he was about 6 months old, so we entered and went along without a clue of what we were doing! Kai came 3rd in his class but then the steward came to us and said he had to go back in because the other two dogs were juniors. He got Best Puppy in Breed and we were over the moon but more was to come as Kath told us we'd have to stay and go into the puppy group. As is common, they did the group alphabetically, so Jeff who was handling had to go running around this ring without having an idea of what he was meant to do! Thankfully, the judge didn't hold Jeff's handling against Kai and he won the group, then went Reserve Best Puppy in Show!!! By then Kai was tired and fed up with this trotting lark, the judge gave him plenty of opportunity to do better - she wanted to give him the BPIS but let's face it, for our first show we could hardly have been more proud! Having such an amazing start, we had caught the bug. Kai didn't disappoint us and he was consistently placed at open and champ show level, getting a Reserve Best Dog from junior class at Champ show level. Our proudest moment had to be Kai's class win at Crufts in 2003, as a child I had dreamt of winning at Crufts and to actually be there with our dog and win a class was that dream come true. Unfortunately this only makes you want to repeat that result! Kodi came next. He taught me so much about the show world. He was once again a consistent dog, being placed at most of his shows and getting Best Puppy in Breed at Champ show level. Kodi is a "pacer" and when he doesn't want to move, he won't. I love him to bits though and he was generally a happy lad to show, retiring from the show scene at around 10 years of age. Then of course Womble and Porsche entered the ring. Porsche was definitely not interested in running around a ring, so we decided to wait until she was mature and see if she liked it then. Womble on the other hand, was bought as a show dog - the first time we'd actually put showing as part of the requirement for a puppy. You can never be sure about whether a puppy will be a show dog but we were hopeful and luckily he has never disappointed! Womble is a swine when I show him, he's vocal and bouncy and whilst I do sometimes get away with this at open show level, he is supposed to behave! I therefore asked his breeder Walt to show him or one of my other friends and he has done very well for himself. In 2007 he won Best Junior In Specialty Show under highly respected US judge Nancy Russell, then at Crufts 2009 I got that dream realised once again when Womble won the Limit Dog class against some very stiff competition. This win also got him his KC Stud Book Number, giving him life long qualification to Crufts. 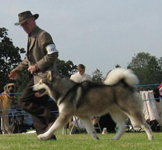 Then in 2011 he won BEST DOG at the Scottish Kennel Club Championship Show under breed specialist Roger Cruden, gaining his first Challenge Certificate, handled by our friend Marina Page. He then won the Reserve Challenge Certificate at the NW&PBS Championship Show under judge Terry Munro, handled by our friend Alanna Blaney and also handled by Alanna he won Best Veteran In Specialty Show in 2013. We're so proud of his accomplishments in the ring. Our one and only litter has seen 3 puppies actively showing, with Ivy already pointed and winning many Reserve Winner places in the USA and Mason having gained his stud book number at Darlington championship show in 2014. Vienna is bringing up the rear, gaining in confidence and having fun along the way. Nobody knows what the future brings but while we enjoy showing, we'll carry on being a familiar sight around the rings. We've made some amazing friends over the years around the show rings and have a great hobby involving the dogs.